Geofence is a virtual boundary for a real-world geographic area. In Bleesk, Geofence is generated as a radius around a store or point location. Customer receives a push notification on his mobile device as soon as he enters the defined radius. Customers who receive a Geofence notification are 2.7x more likely to use app than those who don't receive one. Geofencing uses GPS as well as mobile network triangulation to determine user’s mobile device position and proximity to a set Geofence point. 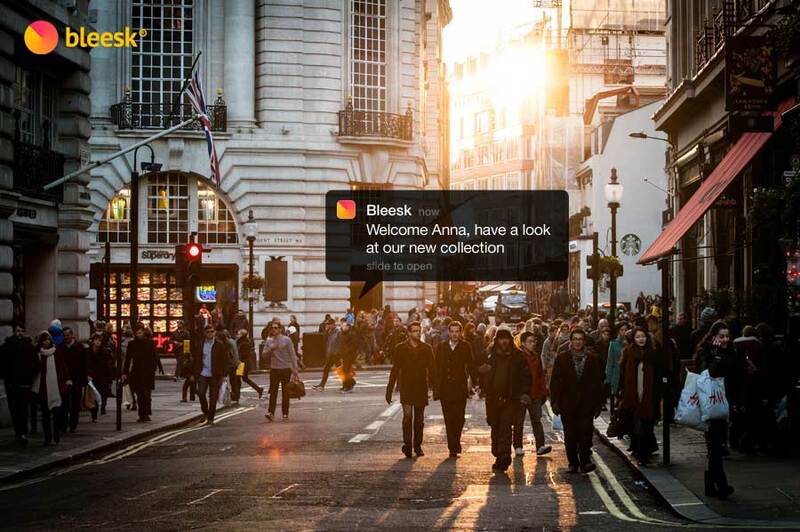 It allows to send push messages to users' smartphones when they enter a defined geographic area, such as a retail store, stadium, shopping mall etc. Customers who receive a Geofence notification are 2.7x more likely to use app than those who don't receive one. What is the difference between Beacons and Geofence? Beacons broadcast tiny radio signals that can trigger certain actions in a beacon-enabled app on a mobile device. Beacons use Bluetooth Low Energy to estimate if a mobile user is within the range of its signal. This allows you to trigger your proximity campaign. Beacons are great for indoors use and when you need high precision, up to few meters. Geofencing is less precise when it comes to proximity detection. This makes geofencing more effective for outdoor proximity campaigns that target customers on a larger area, for example when they are walking through the street or are close to the entrance of a shopping mall. When should I use Geofence? Geofence is great for numerous business cases, one of the most valuable is increasing the number of visitors in your venue. If you want to let your customers know that there is a promotion in your venue, they can even be located 100 meters away from it, simply add a Geofence spot in Bleesk and create a Campaign that triggers notification "Your Comapny Name: Check out our new collection, you're only 100 meters away". Another valid business case is that you want to make sure that people will have bluetooth turned on to receive beacon proximity campaigns indoors. You can simply create a Geofence campaign that will trigger a notification reminder "Turn on Bluetooth to receive more special offers". This significantly increases conversion rates for beacon campaigns. Geofence and Beacons complement each other, so that you can use both of them at the same time.